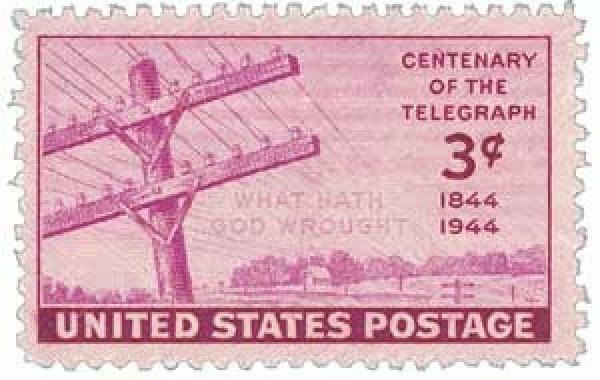 U.S. #924 was issued for the centennial of the invention of the telegraph. On October 24, 1861, Western Union joined the eastern and western lines in Salt Lake City, Utah, completing the Transcontinental Telegraph. The telegraph was the first device to send messages using electricity. Samuel F. B. Morse (1791-1872) is credited with inventing the telegraph. He first demonstrated the telegraph in 1837. Morse also created “Morse Code,” a “dot and dash” system used to send information through the telegraph’s clicking sounds. In 1840, Morse received the patent for the telegraph and in 1844; he built an experimental line from Washington, D.C., to Baltimore, Maryland. U.S. #16T101 – Western Union telegraph stamp picturing Samuel Morse. The telegraph soon became an important form of communication in the United States. Railroad companies used the telegraph to coordinate schedules and improve safety. By the 1850s, telegraph offices existed in every major city. And by the time the Civil War began, telegraph lines were strung from coast to coast, making almost instant communication possible. U.S. #R4 paid the 1¢ revenue tax levied to help fund the Civil War. In 1860, Congress offered up $40,000 a year to any company that would build a telegraph line to join the eastern and western networks. The Western Union Company was one of the largest telegraph companies in the U.S., and was awarded the federal contract to build a line to connect California with the East. Construction began in 1861, and there were many difficulties to overcome. Telegraph wire and glass insulators had to be shipped to San Francisco from the East, and then loaded on horse-drawn wagons to be carried across mountains, deserts, and plains. Telegraph poles had to be transported as well, because there weren’t many trees on the plains and deserts. Native Americans also posed a threat. During the summer of 1861, Sioux warriors cut down some of the completed line and used the wire for bracelets. However, when some of those warriors later fell ill, their medicine man claimed that the great spirit of the “talking wire” had made them ill and they didn’t cut the line again. 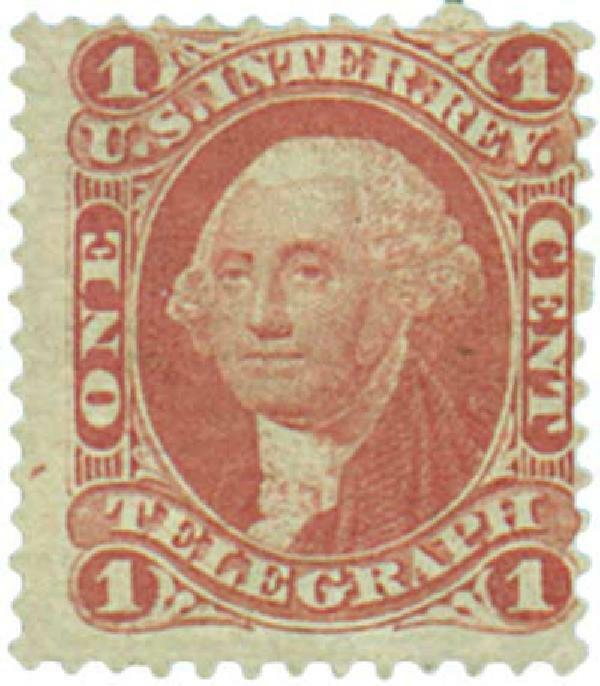 U.S. #16T83 – Western Union Telegraph stamp. In spite of the obstacles, the transcontinental telegraph was completed much quicker than expected. On October 24, 1861, the eastern and western lines were joined in Salt Lake City. California Chief Justice Stephen Field sent the first message to President Abraham Lincoln. It read, “I announce to you that the telegraph to California has this day been completed. May it be a bond of perpetuity (an everlasting bond) between the states of the Atlantic and those of the Pacific.” This bond was essential for keeping California loyal to the Union during the Civil War. U.S. #15T20 – Telegraph stamp for Postal Telegraph Cable Company. One of the fallouts from the line’s completion was the end of the Pony Express. The Pony Express had only been in existence for about 19 months, but during that time it was the most direct means of communication with the West. However, the transcontinental telegraph made east to west communication nearly instant and sealed the Pony Express’ fate. The Pony Express closed days after the line was completed. The telegraph was a relatively new form of communication when the Revenue Act was passed in 1862, but writers of the law included telegrams in the items that were taxed. Item #M11732 – Set of 6 telegraph stamps from different companies. 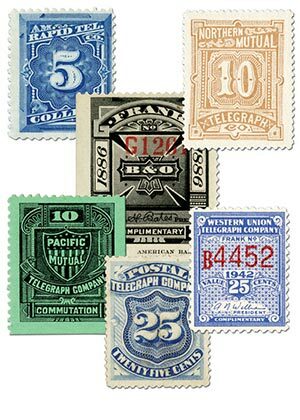 Telegraph stamps were used by private companies for use on their own telegrams. Like U.S. postage stamps, they feature high-quality engraving and printing to deter counterfeiters. 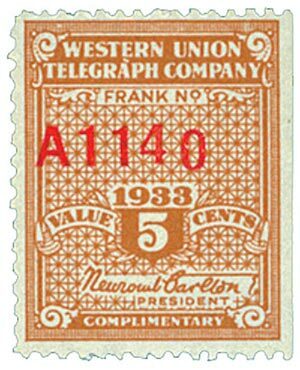 In fact, the American Bank Note Company printed the American Rapid Telegraph Co. stamps and the National Bank Note Co printed the Western Union Telegraph Co. stamps. 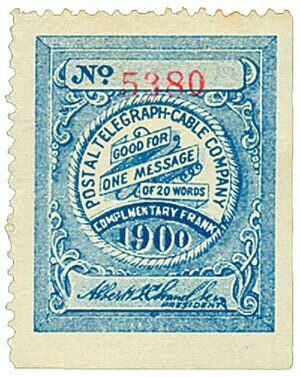 The telegraph stamp was similar to a postage stamp because it verified that a message had been paid for. Telegrams, the messages sent by telegraph, were reserved for urgent news because they were more expensive than sending a letter. Even though the Telegraph Act of 1860 stated that the fee was 30¢ per word, early messages sent on the First Transcontinental Telegraph were charged at $1 per word. 3 Responses to "This Day in History… October 24, 1861"
This was a great piece of information. And in this same decade there was a line laid on the floor of the North Atlantic Ocean connecting the US with Europe. I believe the line on this side of the Atlantic entered the waters off of northeast Canada and re-emerged on one of the peninsulas off of Ireland, perhaps Dingle. Prior to this communication was delivered by ships. This line was in use for 100 years. This is one of the best entries. Historic and interesting. Great job Mystic.